If you don't like kissing and gnawing someone's face off is more your style, you're in for a real treat: Zombie Walk is happening the SAME DAY! 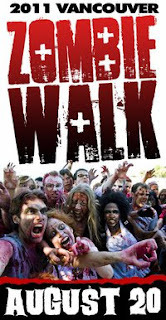 Or maybe the zombies can participate in the kissing flash mob as well! Wouldn't that be a sight to see! Zombie Walk is an annual event where thousands of zombies congregate in front of the Vancouver Art Gallery then take to the streets of Vancouver in a huge fun-filled brain-eating bloody party. Ohh! Thanks for posting this! Haha, no. I would like to though! But I have to attend a dinner later that night right after zombie walk so I won't have time to go home to clean up if I zombielize myself. lol probably not. I'm going to be going out in the morning I don't want to be a zombie the entire day!